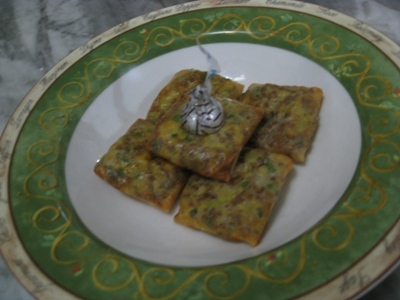 So, my recipe for the week issss…..MARTABAK TELUR!! Aduh..aku kasih tau dulu ya…the preface of the story…because it was an ADVENTURE!!! So jena and v decided to go for a walk…and ya know..get rid of their xtra storage lol. When we went home..jade just finished her kumon hw…and she got an A and it was all very neat! We were very proud of her..so we decided to treat her ice cream! Where better to go? Pepito EXPRESS! Yes, theres a pepito near my home now…next to GWK…so…i’m ecstatic…because…we LOVE PEPITO! ;p So…off we went the three lil pigs…to journey to pepito express…while shopping for goods to make this week’s recipe choice. 1. Panaskan 2 sdm minyak sayur. 3. Masukkan daging sapi cincang. Aduk rata. 4. Setelah daging berubah warna, masukkan bumbu kari. 5. Masak hingga daging matang. Sisihkan. 7. Taruh 1 sdm adonan isi di atas selembar kulit lumpia. (it’s much easier if you have a tablespoon measurement, cuz then it shapes it just right atas kulit lumpianya). Although, i must say this step was tricky. Because there was sooo much eggs in the mix…it was really wet…and when putting a spoonful on top of the kulit lumpia..you don’t want it too wet…or else it’ll be really messy and won’t fold properly. I felt that it’s important…to get just the right amount of meat & egg. Not too wet or else you’ll have a hard time folding it and it will stick with the others! 9. Goreng sambil dibolak-balik hingga matan dan kedua sisinya berwarna kecokelatan. 10. Angkat, tiriskan. Hidangkan bersama acar mentimun dan cabai rawit. Stay with me readers…who knows what will happen to me on my next food journey!!! lol..mo gimane lg…ruko2nya jauh…jd closest stopnya bamboo tree LOL..lucu yahhh bentuk kotak2nya…kyk magic squares hihihi ;p Okay…will do! 😀 Ayo vin..katanya mo masak untuk jena…kpn? I shall proceed on my adventure…thank you! Btw, u could make your own kulit lumpia. Lol…it’s my personal inside joke…it’s called a hershey kiss (chocolate). I’m not really good with presentation & making it look all pretty…and i just make do with what i’ve got…& hershey kisses is what i’ve got!! Yes, it is possible to make your own kulit lumpia! Never tried it tho. Maybe cuz im a supermarket junkie…so I just get already made things lol. There was an indo version of the kulit lumpia…it had a round shape and was much thicker…But i went with the chinese kulit lumpia..i’ve found that it’s much thinner tho.